Ever felt invisible on the road at night on your bike? You’re not alone. Cyclists often complain that motorists act carelessly around bikes and drive as if they don’t exist; drivers on the other hand say that bike riders are unpredictable and don’t do enough to make themselves visible, particularly at night. This helmet addresses both sides of the divide. 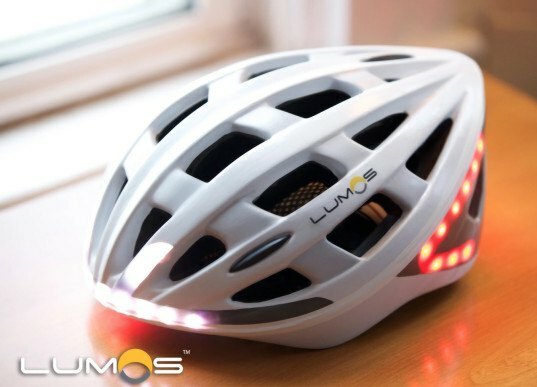 The Lumos helmet has flashing turn signals and automatic brake lights built-in to help riders communicate with other road users and allow drivers to see and anticipate cyclists’ movements. Technology once confined to cars can now become commonplace for bike riders. LED helmets are not new, but integrated wireless turn signals and automatic brake lights are. 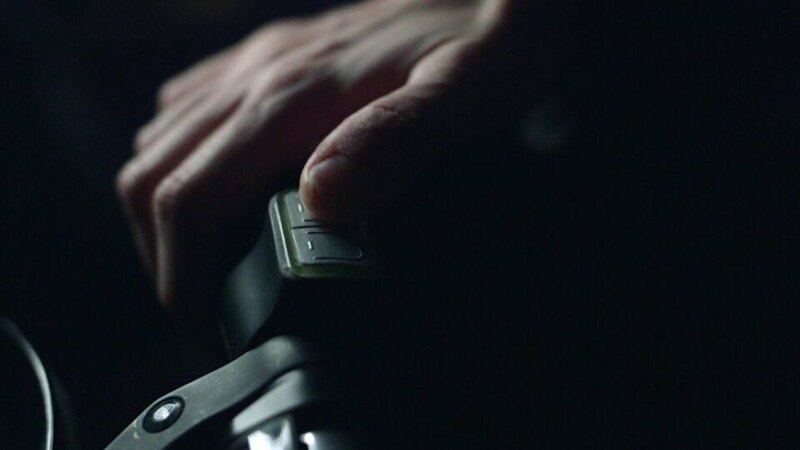 A small wireless remote on the handlebars allows you to signal with the touch of a button and pairs automatically with the helmet when they’re close to each other, and an accelerometer senses when you’re slowing down, triggering the brake-light automatically. Far from just pretty lights or a tech-collector´s gadget, this innovation addresses a serious problem: Each year over 700 people die in bike accidents and nearly 50,000 get seriously injured – and that’s only in the United States. Simply put, lights and signals can save lives, as of course can the helmet itself. You might be wonder, does all the tech make it big and bulky? The Lumos helmet looks like any other helmet until you turn it on: Bright white front lights and a clear red triangle at the back illuminate automatically when you push the power button, the triangle is inspired by cautionary road signs and the front lights outline a unique pattern making you more visible to oncoming traffic and in wing mirrors. Aerodynamic design and a sleek finish means that Lumos has both style and substance. Related: LunaHelm Is a Psychedelic LED Bike Helmet That Makes Sure You’re Seen in the Dark! Ever forgotten or had your lights stolen? The lights are built in to the helmet, so wherever your helmet goes, they go. Better still, a remote right on your handlebars allows you to signal and keep both hands where they should be: on the bike. All of the bits, including batteries and accessories, come included and the helmet is rechargeable using the same type of connection as your phone. The company was the brainchild of Eu Wen-Ding and Jeff Chen who met as students in Harvard and is incubated out of the Harvard Innovation Lab; the idea attracted huge interest on kickstarter and raised over $800,000 in funding, way more than six times the original goal of $125,000 with 6,072 backers. Project funding ended on kickstarter on August 13 and the timeline for the first delivery batch of helmets is set to April 2016. Cycling has exploded as a sport, a hobby and as a clean, green, rapid alternative to getting around congested urban centers. These days you can have a bamboo bike posted to your mailbox and flying bikes are even being tested, but keeping it safe on the ground should probably be our first priority for now. Any innovation that can encourage understanding and improve communication between motorists and cyclists will contribute to cleaner, safer, better roads for all. We think that the Lumos helmet has a bright future. Ever felt invisible on the road at night on your bike? You're not alone. Cyclists often complain that motorists act carelessly around bikes and drive as if they don't exist; drivers on the other hand say that bike riders are unpredictable and don't do enough to make themselves visible, particularly at night. This helmet addresses both sides of the divide. The Lumos helmet has flashing turn signals and automatic brake lights built-in to help riders communicate with other road users and allow drivers to see and anticipate cyclists' movements. Technology once confined to cars can now become commonplace for bike riders.